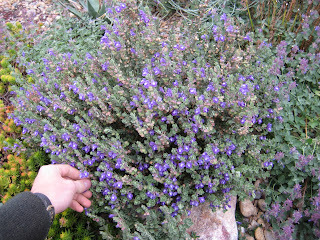 "Must-Have Plants for your Xeric Garden." Here are about ten recommended plants to try, as a starter, but for those who've tried them or want to try a related alternative horticultural challenge, I've provided some less-common, less-grown or less-forgiving plants. I get to push my own agendas here and ignore well-known or heavily-used plants. Xeriscape is a trademarked term, but is vaguely defined, really, so I like to oversimplify it as either watered-dry (mediterranean-dry, lavender-dry) and unwatered-dry (Native, prairie, desert, vacant lot: no regular irrigation) but both must be much drier relative to the very wet usual treatment of landscapes and turf which is common. The only way to know for sure if it is truly drier is to measure. The two best books, I feel for this, are Robert Nold's High and Dry (A brilliant, hilarious, very local listing) and Olivier Filippi's The Dry Gardening Handbook for revolutionary illustrated concepts and techniques, but know that half the plants mentioned are not appropriate for Colorado, being from the mediterranian. To start with perhaps the toughest yet beautiful dry-grower, this is a small shrub, (foreground) late summer-blooming, and will still be beautiful (or even remain more beautiful) if left unwatered after establishment. Rabbitbrush in general must not be discounted for not being flowery. They are. A capacity for incredibly deep "sinking" roots is what gives this little gem my rank as #1 for long-term sturdiness. Mormon teas, (Ephedra)in general must be grown more often. To top the list is our native Ephedra viridis, whose evergreen presence and total lack of need for water to be maintained (like this one photographed) means it ought to replace mugo pines largely in Colorado landscapes. Ephedras do bloom- yellow scaley things in spring (right now on the Western Slope) and many species carry colourful fruit. The most available species, Ephedra equisetina or "Bluestem Joint Fir" sports orange berries on its female plants. But they can be aggressive. Especially the Bluestem jointfir. Our native seems to almost never run, but the blue one has a penchant for firing up whole bushes nearby within a few years. This does not mean we shouldn't plant it, but it means it should be grown drier and in places where it is blocked in by buildings, concrete, or energetic gardeners with sharp tools. A couple dozen species await us to be grown, like E. major at Denver Botanic Gardens with its fat red fruit. 3. Flowering Machines. Zauschneria, or Hummingbird trumpet are coming into the common sphere, especailly 'Orange Carpet,' above. They literally bloom all summer, with a little irrigation. 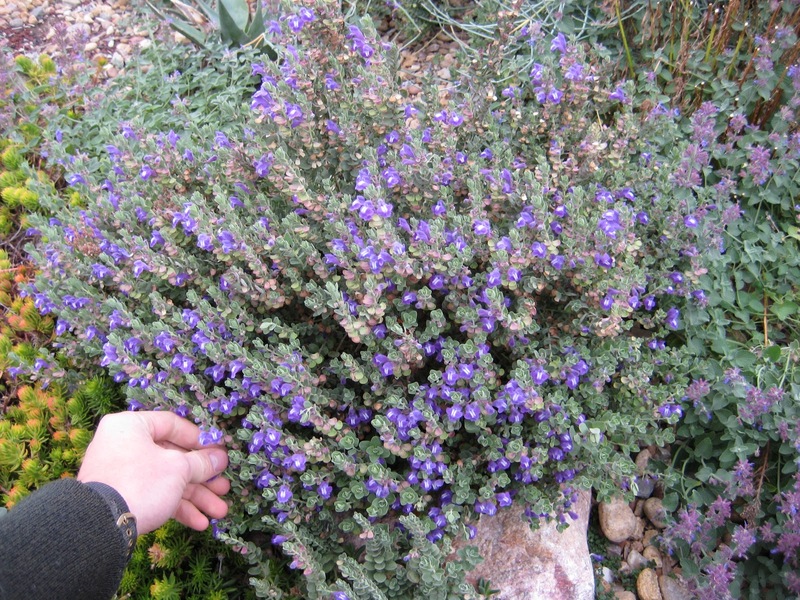 They are herbs (dying to the ground and needing a cleanup of dead stuff in spring) and offer several more species to try, including the larger (and, in my opinion, showier, Zauschneria arizonica. (The above plant looks much like that species, but is indeed an extra-big Z. latifolia garretii. But if you grow the orange flower machine already, the Skullcaps await. Scutellaria resinosa, or Prairie skullcap, stacks more and more flowers on top of old ones and their resultant seed pouches. Glory. But my favourite of the flower-machines is a drier grower, also orange. The Globe Mallows (Sphaeralcea) are harder to find in nurseries and really benefit from bareroot planting for survival, but require so very little water. There are many species, like S. munroana near Laramie, Wyoming. Monroes' Globe Mallow (Sphaeralcea munroana) at Chelsea Nursery in Clifton, CO. The spreading native Scarlet Globemallow (Sphaeralcea coccinea) at home in a vacant lot in Denver. All of the "Flower machines" are herbs, getting longer and taller as they bloom, and becoming dried twigs upon winter, so we thank them for their selfless tireless performances by clearning away their leftover skeletons in late autumn or early spring on a nice day. 4. The pill must be slipped. Cactus are the quintessential dry garden choice, but so many of us were initially repelled by the spiny character of these architectural brutes. Let's not forget that they bloom better than Tulips, say, (and all those colours, as well) but have a presence all year. And need no water in Denver, but will surely grow faster with it. With the Spineless Claret Cup, (Echinocereus triglochidiatus f. inermis) we have us no excuse not to grow it. Some individuals are soft as a green baby's bottom. But the real "Baby" title is held by the miniature Lee's Dwarf Snowball. Peach flowers arise from a plant whose spines point flat, so there are no spines aimed at the viewer or jabbed into the handler. Again, no excuse can be had to not try this plant. And there is no pruning with small barrel cacti! We're lucky in Colorado to have a steady source of this otherwise uncommon or expensive plant at Timberline Gardens in Arvada. For the desirer of grass, but with a space needing a shrub, go get the Giant Sacaton. It's a gas. A great, moundy, giant, gas of a grass. It responds dramatically to the slightest breezy provocation like a misfit teenage girl. (Sporobolus wrightii) You get to use your still-packaged powertools to cut down this puppy in spring. Or don't. That is legitimate, too. But for one less well known (and easier to kill in transplanting) and drier growing, there's the Desert Evening Primrose. (O. caespitosa.) Huge flowers. Huge. And little or no cleanup. 7. More summer rebloomers are always welcome. The first native plant in my life, the Desert Four-o-clock is a giant pillow of magenta frenchhornlets all summer, coming up late. Again, like its reblooming counterparts, it dies to the ground in winter leaving a conveniently-whole giant tumbleweed which can be picked up in spring to throw over the fence of your least-favourite neighbour. 8. No garden dare call itself xeric or dry or native without Penstemons. A pretty much North-American group of plants with literally hundred of species, there's more than a few to grow, blooming throughout the spring and sometimes later. Above, the lipstick explosion of Desert Beardtongue, Penstemon pseudospectabilis. Embrace scientific names, they are good for you. Like vitamins. Easy to forget. Recently more available, the easily overwatered (this specimen is not watered) Penstemon alamocensis. Awesome. Don't miss its leaf and stem colours. Grow some miniatures from seed, like Penstemon arenicola at my buddy John's. And if that one is really too boring for you, seek out the big, shrubby, extra-dry space-filling species. There is a whole old blog on the Shrubby Buckwheat. One day soon, more colours will be available. 10. Lastly, a plant for a certain place, the manzanitas want to be in your garden. They are evergreen, leafy, ground-hugging shrubs, now well availbale as a variety 'Panchito.' Here are the tricks to keeping this one happy: proper planting, perhaps part sun, very happy on a North Aspect, and definitely well-drained soil. A low spot in clay soil is death. A clay slope is possible, and enriched sand is heaven. Larger and harder-to find species, like our Western-Colorado Native "Greenleaf Manzanita,"Arctostaphylos patula is worth the trouble, but it is a lot of trouble and is strict about those above needs. Let us not forget that they bloom in late winter looking all like their blueberry or heather relatives. If you attended a lecture or actually read through a long blog bannered with the words "Must-Have," you might be a helpless collector and lover-of-life, and you mustn't stop with the above ten. There is literally a hole world of wonderful, suprising things to grow. As collectors get crazier, their palnts get smaller (so that they can fit them) and before long they are called "Rock Gardeners" and it all gets out of hand with plants everywhere. Three small gems for the garden who take up no room and don't fight with their neighbours. Above, Bukiniczia cabulica is a biennial (Also called Aeonopsis cabulica- whatever; it's Afghani and great) An alien cabbage-like flat thing one year, a small spray of flowers the next. The Townsend daisies are also tiny and reseed around. At least two, like Townsendia alpigena (aka T. montana, above) and T. rothrokii rebloom. Lastly, the Utah Milkvetch. Dashing in leaf and flower. It demands total contol over a whole four inches of garden space and two inches of airspace, so there is a lot of room in any garden for so many kings and queens. Get out there this sping and try something (or a lot of things) new. Spring is here, so blogging is back-burnered, but still important, like the teakettle. Astragalus spatulatus and Cryptantha humilis v. nana. Supplied by Sunscapes Nursery in Pueblo, CO. The latter is the most excting thing at present because I've just found that it smells exactly like freesia. Astragalus purshii, grown expertly by Mike Kintgen at Denver Botanic's biggest Crevice Garden. Please note the colour of the buds; that's the fun bit. Mike and I gave a Crevice-Gardening lecture and workshop at Timberline Gardens in Arvada, CO, a weekend or two back. It was warmly recieved by a wonderful and big crowd. What a ball. I thank everyone for coming. Townsendia spathulata is perhaps the best little Townsend daisy. Pink/purple petal backs make it interesting when the flowers close at the setting of the sun. My gratitude to Woodstove Warehouse on South 7th in Grand Junction for letting me tear into their dirt for a desert landscape (to be ultimately unwaterd). There is sometimes nothing more juicy than a prepared and blank canvas! Possibilities! Penstemon congestus. Supplied by Agua Fria Nursery, Santa Fe, NM. Do whatever you must to stay outside.